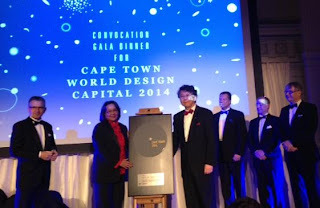 At an impressive gala dinner and convocation ceremony tonight in the City Hall in Helsinki, Helsinki handed over the designation of World Design Capital to Cape Town for 2014. Soon in Lee, President of Icsid, was joined by the Mayors of both Helsinki and Cape Town at the unveiling of the ceremonial plaque that celebrates Cape Town's designation. Now the hard work begins in bringing design to a city that is hungry, in the words of Cape Town Mayor Patricia de Lille, "to bridge the divides of the past". In an emotional speech, Mayor de Lille indicated with great compassion what this designation means for the city and communities of Cape Town and the region. The ceremony followed Helsinki's one-day, Closing Summit chaired by Marco Steinberg. I had the honour to be the lead speaker for the panel session on design and growth. The Summit was attended by around 250 delegates including the Mayors of Taipei, Stockholm, Lahti and of course Helsinki. Congratulations to Helsinki and in particular to its Director Pekka Timonen for a very successful 2012 and to the World Design Capital team for Cape Town, as they assume the title of World Design Capital - the first city to do so in the continent of Africa.